Autograph Letter Signed, "George Emery Harvey" 2-1/2p. 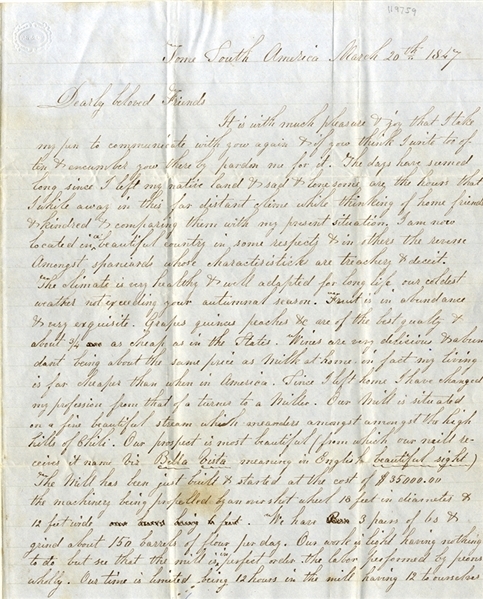 quarto, March 20, 1847, Tome, South America, with integral leaf addressed to James Whitman, in Charlestown, Massachusetts, in part: "…The days have seemed long since I left my native land..I am now located in a beautiful country in some respects & in others the reverse amongst Spaniards whose characteristics are treachery & deceit…Grapes, guinas, peaches, &c. are of the best quality & about ¾ as cheap as in the States. Wines are very delicious…living is far cheaper than when in America....I have changed my profession from that of a turner to a miller. Our mill is situated on a fine beautiful stream which meanders amongst the high hills of Chile…" VG.